Hi Everyone! I usually stick with 5th grade material on my blog, but this season I came up with a super cute idea for the younger grades and really wanted to share! I call it "Noun" is the Time to be Thankful! Students get to practice what a noun is by writing about a person, place and thing they are thankful for! 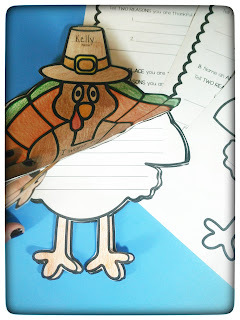 The booklet is in the shape of a turkey which makes it even more fun for kids! To guide students in their writing, I included an outline of questions for them to plan their paragraphs. 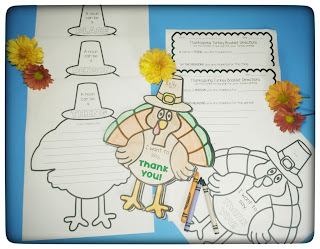 After they have written their paragraphs, each on a separate turkey, they color in the cover page and cut them each out. Finally, they place all the pages together and share their book with their family during Thanksgiving dinner! If you do this with a few weeks before Thanksgiving, you can make a bulletin board with them! They would be so cute hanging up around the classroom!